Ingrid West Machinery is a leading European distributor of coil winding machines, together with associated production aids and technology. IWM provide highly cost effective manufacturing solutions for the production of wound components of all types. As a well-established company, we take great pride in our track record of over 50 years of high quality service to the coil winding industry. As a small, highly efficient business managed by the owners, we are able to pay close attention to the needs of our customers. We work closely with our European partners, to provide local sales, support and service assistance for coil winding machines throughout most of the EU. 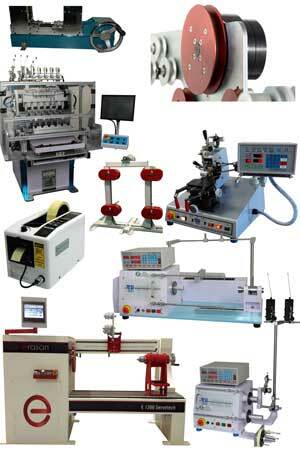 On this website you will find details of most of the major items of coil winding equipment that we offer. Our extensive range of coil winding machines can produce small transformers (toroid and bobbin), large power distribution transformers, solenoids, sensor and RFID coils. We also provide specialised equipment for dispensing insulation tape, coil taping and wire insulation stripping. Our specialist engineers are experienced in all aspects of coil winding technology, and we can often provide innovative solutions to difficult coil winding problems. If you don't find the item that you are looking for, please contact us and we will always do our best to assist.